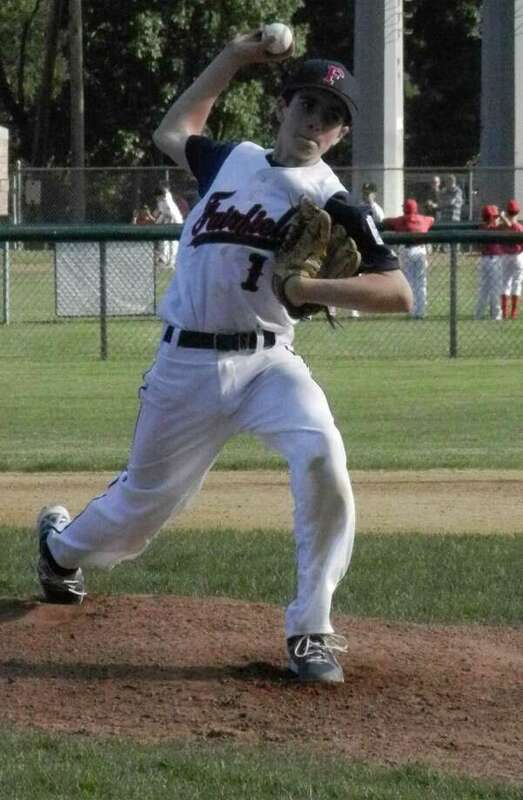 By each earning abbreviated 11-0 victories with the mercy-rule being invoked, both Fairfield Little League baseball all-star teams remained unbeaten Friday afternoon at Trumbull's Unity Park in District 2 pool play. They are a combined 5-0 and might be a step or two away from heading to the four-team, double-elimination tournament that starts in 10 days . Both team's starting pitchers, each of whom was relieved in the fourth inning to stay within weekly pitch-count limitations, gave up one hit and benefitted from their batters connecting on a series of home runs, seven in all. One round tripper cleared the fence by close to 100 feet, landing in the outfield of the adjoining diamond. The Fairfield American Little League all-stars beat Redding 11-0, improving to 3-0 after blasting five homers on Sam Davenport's three-and-two-thirds innings of one-hit ball. He was relieved by Brian Howell, who got the final out after having belted a pair of home runs. The Fairfield National Little League selects defeated Stratford 11-0, raising their record to 2-0 after smacking two home runs on Michael Murphy's three-inning one-hitter. He was relieved by Brett Lauterback, who got the final three outs in the fourth inning. The Americans can clinch a berth in the double-elimination phase in District 2 on Monday if they get past Trumbull National (2-0) in a 5:30 p.m. game and win the five-team Red Division. The Nationals have games remaining in the Blue Division on Monday against the Trumbull American stars (1-0) at 7:30 p.m. and on Thursday against Bridgeport North End (0-1) at 5:30 p.m. Two teams from each division, with the best records or those tied but advancing from advantages on tie-breakers, will qualify for the knockout round July 7-12 at Unity Park. Davenport took the mound in the bottom of the first inning for Fairfield American with a seven-run cushion. The most productive hit of the opening rally was third baseman Brian Kiremidjian's three-run home run. After the top of the second inning, Redding (0-2) was trailing by 9-0. Brian Howell, who knocked three out of the park in Wednesday's 20-2 victory over Easton, drilled another home run, then catcher Vince Camera made it back-to-back homers with his drive that left the field during the next at-bat. The Americans scored two more in the third for their 11-0 lead. The runs came on homers not-so-suprisingly, another by Howell with the other off the bat of left fielder Jamie Flink, Fairfield's starting pitcher against Easton who went 2-for-3 against Redding. Fairfield American batters hit a bump in the fourth inning when they did not produce a run, the first fruitless inning at the plate since the first inning of their game on Monday against Monroe, a 7-4 walkoff win on a Howell homer. "Our hitting has been phenomenal," said American manager Michael Steed. "That's 38 runs in three games. A couple of kids had been overswinging, but we went back to basics in practice (on Tuesday and Thursday)." Steed noted the three strikouts by Fairfield batters were first three of the tournament, following the opening two games being strikeout free. First baseman Ian Bentley, the reliever in Wednesday's game, was 2-for-2 at the plate. Howell went 3-for-3 with six runs batted in and cracked the tape-measure homer to center field that briefly delayed the Nationals' game with Stratford. "The pitching has been fantastic. The pitchers have really been hitting their spots. Vince Camera (3-for-3) has been an unsung hero back there (behind the plate). He keeps the pitchers calm. He's been doing a good job calling pitches. We (coaches) are helping him call the game. We're trying to teach him, so he's ready for the next level," Steed said. Davenport threw 50 pitches. He walked one batter, hit another with a pitch and struck out six Redding batters. He induced three outs on grounders. Howell's relief appearance included giving up a hit before getting the last out after throwing five pitches. Steed characterized Fairfield American's fielding as reliable with few if any errors, none costing the team. The limited base running mistakes, he said, have not been costly either. The Nationals' path to their mercy-rule win was different from the Americans, whose shortened game ended sooner. Fairfield National scored once in the top of the first inning before adding two in the second inning. The Fairfield third inning yielded four runs, with another four tacked on in the fourth. Murphy's one hitter was not similar to Davenport's, though Murphy's pitch count reached 50, too. Murphy got into a jam in the third inning by loading the bases, but he escaped -- protecting the shutout -- with a called third strike, his third strikeout of the inning. Murphy needed 26 pitches in the inning. "He was strong," said Nationals' manager Dr. Brad Weinstein. "Stratford's batters came out aggressive, and Michael was able to hit his spots." Murphy struck out the side in the first inning, winding up his outing with six strikeouts. He hit one batter and walked two. He made a sharp fielding play when he started a double play in the bottom of the second before Fairfield National had opened a comfortable lead. With runners on first and third base for Stratford (1-2), Murphy fielded a comebacker cleanly, noted the base runner breaking for the plate from third, then quickly turned to fire to first baseman Chris Saladin, whose hurried relay throw to catcher Nick Giacomazza barely nipped the runner at the plate. "That was key," Weinstein said of the play. "That was one of the turning points of the game." The game's tone changed on the Nationals' long balls in the middle innings. Nick Scaglione's homer in the third inning pushed Fairfied's 4-0 lead to a 6-0 cushion. An inning later, after the Nationals' lead had grown to 8-0, Giacomazza's drive to center field went the distance for a two-run home run. Fairfield needed three hits to open its 1-0 lead. Center fielder David Summers, the Nationals starter on Wednesday in their 10-4 win over Westport, drove in the run with a double. Small ball was the formula in Fairfield's two-run second inning. Right fielder Jack Pearce and second baseman Ben Steele began the inning with singles and Murphy drew a walk to load the bases. Pearce stole home, then third baseman Matt Raab bounced into a fielder's choice that brought in the third run. Weinstein used his bench liberally. He refused to assess his team's chances of qualifying for the district's Final Four. "No, we're just going to go at this one game at a time," Weinstein said. "We're going to watch (our next opponent) Trumbull (American) play this (7:30 p.m.) game right now."